Last week, I reported on a possible conflict of interest over a mammoth urban development in Uzbekistan. The mayor of Tashkent responded to my claims — here’s my reaction. Tashkent City Press Conference, 31 January. Source: BBC Uzbek / YouTube. On 29 January, openDemocracy published evidence linking the mayor of Tashkent, Jaxongir Artikxodjaev, to commercial, construction and investment interests which have been awarded a slice of Tashkent City, a mega-development labelled Uzbekistan’s biggest-ever property venture. Last month, another investigation showed that one of the foreign investors in this project, a German company, appears to be hiding its true identity behind layers of corporate ownership. This press conference also followed claims by Radio Free Europe/Radio Liberty’s Uzbek Service that employees at one of the construction companies linked to Artikxodjaev were working in “slave-like conditions” on the Tashkent City project. Likewise, there are ongoing reports of communities in Tashkent being displaced and dispossessed by this massive construction project. On Thursday 31 January, mayor Artikxodjaev convened a press conference where he responded to claims about the Tashkent City project. First, credit where credit is due. Mayor Artikxodjaev has attempted to address some of the concerns formally before local journalists. This is a positive example of improving public accountability in Uzbekistan, although there is a long path ahead. In the same spirit of public accountability, a response is required to the mayor’s press statement. With respect, this was not a startling revelation. Artikxodjaev’s role in the Akfa Group has been widely reported. But it is now formally confirmed, which is a step forward. However, what is of greater concern are the links documented in the original article, connecting Artikxodjaev to Discover-Invest and Dream City Development, along with Akfa Dream World – companies with construction, commercial and investment interests in Tashkent City. The mayor and mayor’s office do not appear to have directly addressed the multiple lines of evidence indicating a direct link between the Mayor and these companies. Discover-Invest’s ties to the Akfa Group were prominently displayed in its promotional material, until, that is, Artikxodjaev became acting mayor. It still needs to be determined then whether the mayor has employed a nominee shareholder to hold this Discover-Invest interest on his behalf? And why did Discover-Invest remove the Akfa brand from its Facebook posts in May, shortly after Artikxodjaev’s appointment as acting mayor? Those questions aside, it would be misleading to liken a stake in firms obtaining a significant slice in Tashkent City to holding shares in Apple of Boeing, as the mayor did. The companies at the centre of this controversy appear to have been awarded their stake in the Tashkent City development after Artikxodjaev was appointed to head the public authority responsible for overseeing this property venture. The situation, accordingly, is distinctly different to the example that Artikxodjaev brought up during Thursday’s press conference. In the case of Tashkent City, the firms in question are conducting business that falls directly within Artikxodjaev’s public portfolio, and it could be that they gained an interest in Tashkent City after Artikxodjaev obtained his public role. In which case serious questions emerge. When government decisions were made on Tashkent City that benefited Artikxodjaev’s companies, did the mayor openly declare in advance his beneficial interests in these firms? Did Artikxodjaev recuse himself from all meetings and decisions that impinged on his business interests? That Artikxodjaev has no involvement in the day-to-day management of these companies is irrelevant. If it was discovered he employed his position in government to curry favour for a firm in which he has a beneficial stake, this would be corruption by any definition. Promotional video for Tashkent City project. During the press conference, the mayor suggested that, despite strenuous efforts, he was unable to attract investment in Tashkent City. The development of Tashkent City was left, Artikxodjaev contends, to a few courageous businessmen who were prepared to take the risk for their nation. This is a surprising admission. Tashkent is one of Central Asia’s thriving capitals and is brimming with possibility. The project itself has been declared one of national significance, with a raft of state supports, which will only service to boost profit margins. But if, hypothetically speaking, we accept the mayor’s argument that investors were not interested, then surely that would indicate this project is not meeting a market need, which is a core determination influencing investor choice. The inability to attract interest from some 700 interested parties, however, more likely suggests one of two things: that the winners in this process had been decided in advance; or that potential investors are not convinced that their interests would be protected by an impartial civil service, independent courts and a transparent commercial environment, where accurate and credible information is readily available. 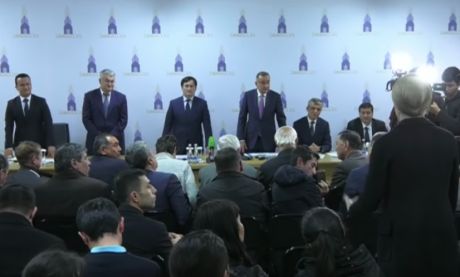 At the press conference, the mayor also appeared to suggest that, while his companies will participate in Tashkent City, they will not retain ownership. Currently, no substantive information is available on the tender process (if they took place) at Tashkent City, including bids received, awards made and the contract amounts. (A minor, but telling point: when the Tashkent City project administration was contacted for comment on last week’s article, press requests for information were left unanswered.) We also don’t know if these firms are to receive other benefits or concessions, such as state subsidies and public loans. It is impossible, therefore, to determine who will earn what, if the anticipated profit rates are reasonable, and whether there are red flags indicative of potential wrongdoing. The mayor also remarked that he is prepared to accept anyone who demonstrates an interest in Tashkent City as an investor. 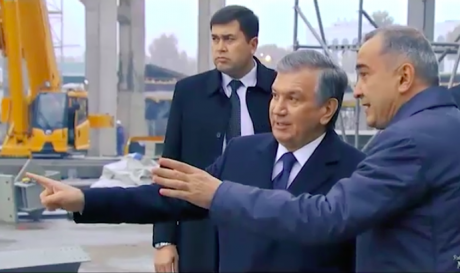 President Shavkat Mirziyoyev and mayor Jahongir Artikxodjaev inspect a Tashkent City site. Source: YouTube. The example of the German investor in Tashkent City, Hyper Partners GmbH, is instructive in this regard. Its principal shareholder is a 19-year-old man with no previous business experience. Open Democracy’s investigation links this company to a corporate network run by Uighur businessmen from Kazakhstan and Xinjiang. At the same press conference, Uzbekistan’s deputy minister of investment and foreign trade, and the first deputy minister of economy and industry, both stated that the Uzbek authorities do not legally have the powers to demand further information about who stands behind foreign investment companies. Laziz Kudratov, deputy minister of investment and foreign trade, went on to state that Hyper Partners GmbH is an affiliated company, but did not clarify who Hyper Partners’ parent company is. Large-scale property developments are plagued by three evils: fraud, money-laundering and bribery. A failure to conduct proper due diligence on who is investing, their track record, and the origins of their capital, exposes the government and public to serious risks. It would be extremely damaging to the international profile of Uzbekistan if it was discovered this property venture is a front for organised crime, or a cash cow for politically exposed persons. Failure to scrutinise investors and their track records courts this risk, and is highly irresponsible. You don’t need to dredge far into Uzbekistan’s recent history to understand why. A company that Gulnara Karimova, the former president’s eldest daughter, used to channel bribes from international telecommunications was owned on paper by her 20-year-old assistant, Gayane Avakyan, who had no experience in the telecoms sector. The fact that this woman was receiving tens of millions of dollars for providing technical advice to international telecommunications firms was a massive red flag, as we know following a 2016 Dutch court ruling. In this $1.3 billion urban redevelopment programme, the Mirziyoyev government’s chase for foreign investment appears to be following a sadly familiar path of opaque financial dealings at the top and dispossession at the bottom. The apparent disregard for transparency, due diligence and accountability courts many of the corrosive forces that plagued the Karimov regime, except now it appears such corrosive forces may be given a freer hand. While this may inspire pockets of extreme wealth, and extreme power, it is unlikely to be the route through which a fair, secure, and free nation is brought into being, following decades of autocratic rule. Want to get in touch with Open Democracy? Please write to media@opendemocracy.net.